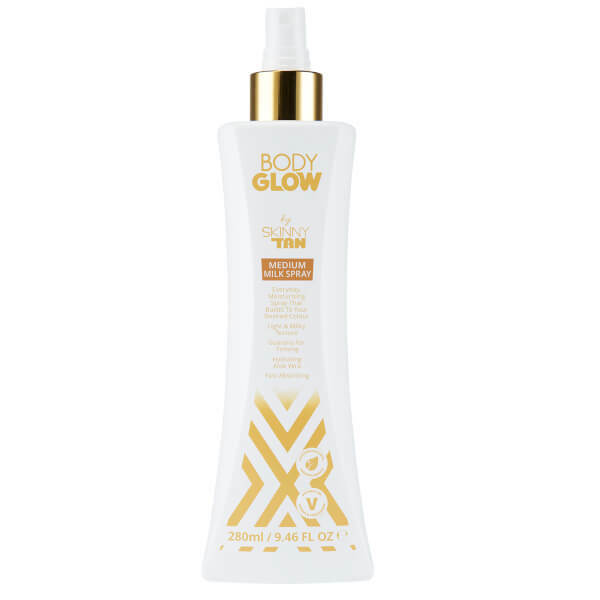 Enhance the look of your skin with Body Glow by SKINNY TAN Medium Milk, a daily moisturiser enriched with a hint of tan. Formulated with a cocktail of smoothing oils, Aloe Vera and naturally-derived guarana, the moisturiser effectively softens and nourishes skin while gently building a light to medium, streak-free colour; just enough for a hint of subtle radiance. Use in place of your classic moisturiser and enjoy its delectable Coconut and Caramel scent. Housed in an easy-spray bottle for spritzing onto skin. Apply evenly to exfoliated, clean, dry skin. Wash hands with warm, soapy water after use. Apply daily or as desired. Aqua (Water), Cocos Nucifera (Coconut) Oil, Dihydroxyacetone, Glycerin, Polyglyceryl-6 Stearate, Helianthus Annuus (Sunflower) Seed Oil, Parfum (Fragrance), Cetyl Alcohol, Glyceryl Stearate, Polyglyceryl-6 Behenate, Xanthan Gum, Ethylhexylglycerin. Aloe Barbadensis Leaf Juice, Disodium EDTA, Paullinia Cupana Seed Extract, Citric Acid, Phenoxyethanol, Potassium Sorbate, Sodium Benzoate.